This is an older list, for a 2018 version you can click here. ‘Tis the season to to buy your Christmas gifts from local artists and makers! Winter is upon us, the end of the year is just around the corner and Creative Dundee is here to help you find a perfect gift from local makers and markets! To save you searching high and low for opportunities to spend your hard earned cash on gifts for your loved ones, we’ve compiled a list of all the markets, events and pop-ups happening across Dundee to provide you the perfect opportunity to pick up something unique and local! What better way to kick off the Christmas shopping season than a fantastic opportunity to buy local and direct from artists and makers! 28 artists and makers will feature over the duration of the Festive Pop-up and will showcase the wealth of talent dispersed across our beautiful county. Enjoy the best of the area’s food, drink and craft producers in Dundee’s newest outdoor event space, Slessor Gardens on the evening of Light Night. A Winter market is always a great way to spark some Christmas spirit. This outdoor market will be selling a variety of delicious street food and drink so wrap up warm and enjoy a hot drink and snacks as you explore the stalls for Christmas gift ideas. A glitzy and glamorous sale with a great chance to pick up your very own unique and original Christmas gift from from local artists and makers. Last year was buzzing and this year promises to be even bigger and better. The sale will have paintings, drawings, limited edition prints, jewellery, handmade fashions, clothing, textiles, knitwear, bags, ceramics, accessories, cute stocking fillers and more from the WASPers and of course, the sale will also include a few special guests from creative businesses around our fair city. Join Tea Green & Taypark House for THE festive shopping destination in Dundee! Set to be an unmissable event, this pop up boutique will be host to an eclectic selection of nearly 50 of Scotlands most talented creative talent, many local to Dundee all set against the stunning back drop of Taypark House and The Stables. We are also thrilled to be stocking the brand new Archies colouring book, which has work from many Dundee artists, 100% of sales from this book will be donated to the Archie foundation. Taypark house will also be bringing the produce of local food and drink suppliers as well as quirky furniture and late night shopping events to get you in the festive spirit with live music, food, drink & free tastings all while you tick off those special gifts in style! The German Christmas fundraising event returns bigger and better this year. A whole day of Christmas themed foods, drinks as well as an arts and crafts market all in aid of Maggie’s Dundee. Come and visit the centre for a day of Christmas fun. There will be a Christmas market with regional makers selling design, arts and crafts, Christmas food and drink, music, a raffle and the distinct atmosphere that has made previous events so special! Be sure to explore the Winter Fayre in the High Mill at Verdant Works this year. This beautifully restored building is a fantastic space for events and will have an assortment of vendors selling their wares in the lead up to Christmas. Join them for mulled wine, mince pies and a wee wander round the beautiful building to see if you can pick up some great gifts for friends and families. Admission to the Winter Faye is free of charge, however there is a charge if you want to visit the other parts of the museum. Buy directly from over 30 talented independent designers and makers! Dundee Contemporary Arts is excited to be bringing together some of the best contemporary makers from across Scotland, all under one roof! With jewellery, textiles, illustration, print, homeware and more, you’re sure to find unique gifts for family, friends and maybe even yourself. Monikie’s Country Park Festive Weekends include a Christmas market, and many other things for the whole family – including workshops, a café, bouncy castle and much more! The Christmas Night Market at Duke’s Corner showcases local food, drink and craft! It is a great opportunity to shop but also have an enjoyable time at the excellent venue. Crafts to be made available by: The Rosebud, SPILTHdesign, Marshmally, Textile Designers DJCAD, Marbled Melts, April Black Designs, Magdalen Green Photography, Hunter’s Bothy, The Candle Bothy. Glamis Castle Christmas Market: December 8th, 9th & 10th. Enjoy a variety of Satallholders and eat & drink at the Glamis Castle Restaurant. Whilst there you can also enjoy special Christmas-themed tours and a Santa’s Grotto. Crafters and delicatessen shall fill the courtyard at the back of the castle and shall provide lots of festive goodies for all your Christmas shopping needs. 10:30am-5pm on all three days. 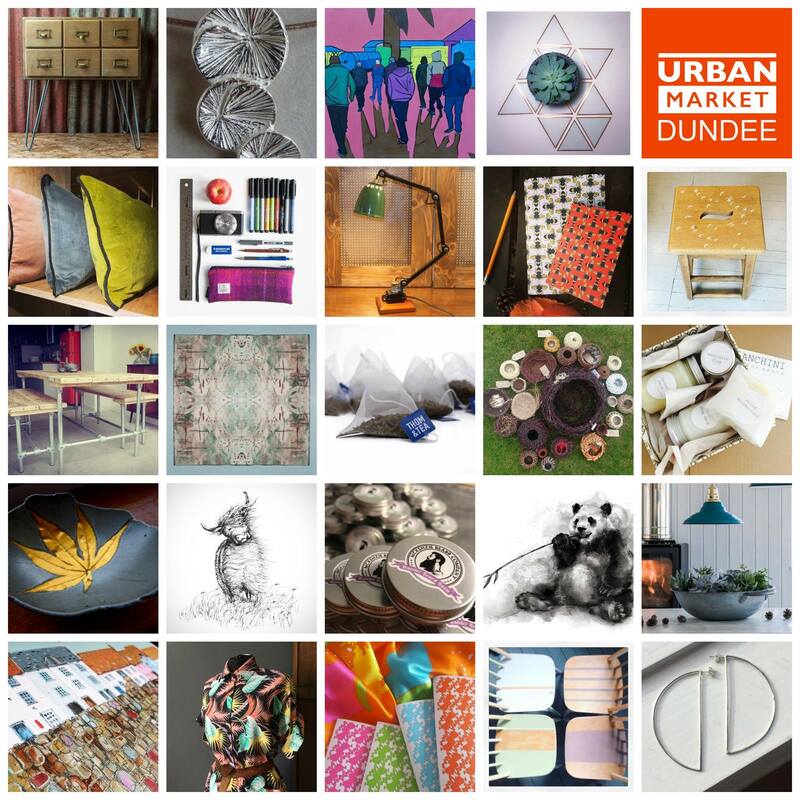 Take a more relaxed approach to Christmas shopping this year at the very first Urban Market Dundee in West Ward Works! The market will be jam-packed with incredibly talented traders, all hand picked for their expertise and quality of what’s on offer. Shop and support local artists, designers, makers & independent retailers & traders whilst enjoying a laid back afternoon with food and drink from local producers, food trucks and businesses. If you’re still stuck for affordable Christmas presents, then PopDundee’s last event of 2016 will be THE market for you! PopDundee has teamed up with The Circle Dundee to create their biggest art & craft pop-up so far, aiming to host as many as 50 artists at the space!! To make this event extra special, everything being sold will only be £10 or less, and the venue will also count on a pop-up café! Join a fantastic day of all things Christmas with selection of high quality stalls in the centre of Dundee. Find a range of wonderful Christmas happenings from local food producers, gin distillers, chocolatiers, local breweries, bespoke jewellery and gorgeous gifts, not forgetting special Christmas hot drinks with mulled cider and wine for the festive season.